3 & out for KU after the takeaway by the defense. WVU takes over at its own 23-yard line after 37-yard Kyle Thompson punt. #KUfball down 21-14 at No. 9 WVU. 4:21 left in 3Q. Bender gave it right back. Next QB up. That's a great start for Kansas. West Virginia is 3 of 6 on third down today. Entering today, the team ranked No. 4 in the nation with a 59 percent success rate on third down. Pettaway 13 yard run on 3rd and 12 ... 2 plays later Grier hits Pettaway for 12-yard TD. Would think someone would be watching the RB. That's ok. We probably won't want another TO later. We had no answer to that blitz. Just took it. On 3rd and 7 WVU comes after Bender and drops him easily with 3 defenders closing in. Loss of 15 yards. Lassiter tries to close in on fair catch but can't field it cleanly. Ball bounces up and hits him, gets away and WVU recovers. Daniel Wise living in the West Virginia backfield, playing phenomenal game for #KU kufball. Has 3.5 TFL, 2 sacks. 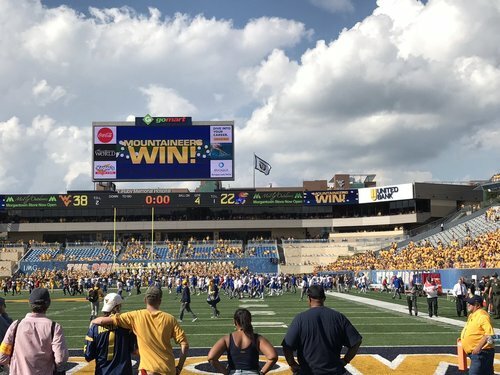 WVU 28, Kansas 14, 7:31. Staley nails a 49-yard FG for WVU. Most had WVU hanging 58 on us. So from that aspect, we did better than projected. Really the muffed punt was the turning point of the game, that would have possibly made the final score closer. TV announcer making the case why Beaty should get one more year. I was thinking this was his last game.